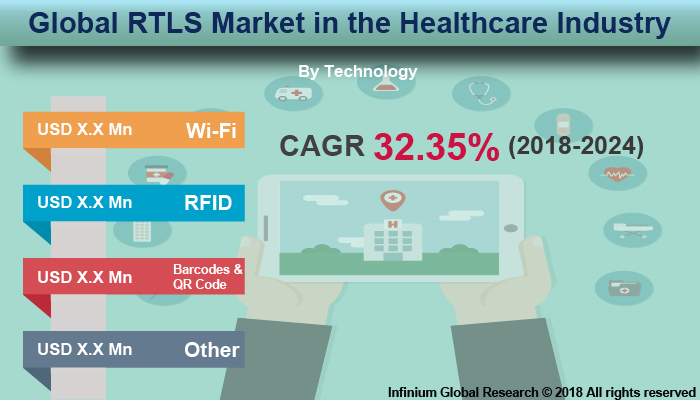 A recent report published by Infinium Global Research on Real Time Locating System Market (RTLS) in the healthcare industry provides in depth analysis of segments and sub-segments in global as well as regional real time locating system market in the healthcare industry. The study also highlights the impact of drivers, restraints and macro indicators on the global and regional real time locating system market in the healthcare industry over the short term as well as long term. The report is a comprehensive presentation of trends, forecast and dollar values of global real time locating system market in the healthcare industry. According to report the global real time locating system market in the healthcare industry is projected to grow at a CAGR of 32.35% over the forecast period of 2018-2024. To track and identify various assets and objects real-time location system or RTLS is implemented. RTLS offers communication between the local engine and the object to be tracked to provide accurate information about the various assets or objects. The cloud-based application of RTLS in hospitals provides location system is accessible to any authorized staff member and from any computer or mobile device with internet access the staff member can find equipment from wherever they are, instead of finding a computer loaded with custom locating system software. The technology advancement in RTLS such as improved effectiveness across an enterprise and cost saving is likely to boost the growth of the market. The demand for RTLS is increased due to rise in adoption level of the product in healthcare that helps in improving productivity of inventory management system and supply chain management to provide appropriate results to track the delivery of the object. Growing necessity of efficient medical devices worldwide is expected to drive the development of the product in healthcare market in the coming years. Government support for promoting the usage of RTLS and decreasing prices of RTLS components will help the market to grow. Moreover, growing demand for automated pharmaceutical distribution system, point of care solutions and electronic medical records is expected to drive the growth of the market. Rising incidents of expiration of medication due to improper storage and stock outs which results in revenue loss is expected to boost usage rates over the forecast period. The use of multi-resonator based chip-less RFID tags is anticipated to show positive impact on the growth of the market in the coming years. Constant research and development initiatives by non-profit organizations including Health Industry Business Communications Council (HIBCC) are a major driving factor for the growth. On the other hand, increasing anxieties regarding privacy and operational challenges are likely to limit the adoption rate of RTLS solutions in healthcare industry. In addition high cost of installation and maintenance is likely to hamper the growth of the market. Furthermore, the development of novel products that is Smart Face Technology and TexTrace RFID tag are expected to propel the demand in the coming years. Among the regions, North America is expected to be the largest market RTLS market in the healthcare industry over the next six years. The presence of a large number of hospitals, health facilities, and senior living facilities is the key factors drives the growth in this region. The developing healthcare industries and infrastructure in the emerging countries such as India and china is likely to boost the fast growth of Asia-Pacific region. The report on global Real time locating system market in the healthcare industry covers segments such as, technology, solution and application. On the basis of technology the global real time locating system market in the healthcare industry is categorized into Wi-Fi, RFID, barcodes and QR code and other. On the basis of solution the global real time locating system market in the healthcare industry is categorized into system and tags. On the basis of application the global real time locating system market in the healthcare industry is categorized into asset tracking and management, patient tracking, staff tracking, environment monitoring, clinical operations and workflow and other applications. The report provides profiles of the companies in the global real time locating system market in the healthcare industry such as, GE Healthcare, IBM, Awarepoint, CenTrak, Emanate Wireless, Stanley Healthcare, Versus Technology, Inc., Teletracking Technologies, Inc., Centrak, Inc. and Sonitor Technologies, Inc. The report provides deep insights on demand forecasts, market trends and micro and macro indicators. In addition, this report provides insights on the factors that are driving and restraining the global real time locating system market in the healthcare industry. Moreover, IGR-Growth Matrix analysis given in the report brings an insight on the investment areas that existing or new market players can consider. The report provides insights into the market using analytical tools such as Porter's five forces analysis and DRO analysis of real time locating system market in the healthcare industry. Moreover, the study highlights current market trends and provides forecast from 2018-2024. We also have highlighted future trends in the real time locating system market in the healthcare industry that will impact the demand during the forecast period. Moreover, the competitive analysis given in each regional market brings an insight on the market share of the leading players. This report will help manufacturers, suppliers and distributors of the real time locating system market in the healthcare industry to understand the present and future trends in this market and formulate their strategies accordingly.